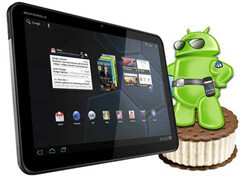 Motorola Xoom, Motorola's first Tablet PC and also the first Table PC with Android 3.0 system. Motorola Xoom first appeared on the consumer electronics show in 2011, and became famous afterwards. 10.1 inch's screen size, 1280*800 high resolution ratio, and with mini HDMI connector, videos can also be played on TV with wider screen. 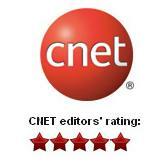 Motorola Xoom can perfectly support 1080P format movie and is definitely a great HD player. Many users possess Motorola Xoom may think of watching DVD movies on it. However, as we know, DVDs are with VOB format and Motorola Xoom only supports MP4 video format. So how to easily and fast watch DVD movies on Motorola? Sounds complicated? With this powerful Motorola Xoom Converter, it will be a very easily thing. Firstly we can have a brief view of Motorola Xoom Converter and its main function. Motorola Xoom Converter is popular worldwide and known for its easy to operate interface, fast speed in DVD copying and powerful functions. It's an all-in-one DVD decryptor, DVD copier, DVD cloner, DVD converter, DVD shrinker and DVD burner. This article, we will focus on its DVD converter function and describe how to easily convert DVD movies to MP4 and watch on Motorola Xoom. Herewith the steps. Insert a DVD into DVD burner and lauch the program. then click "Open DVD" button to load the DVD. 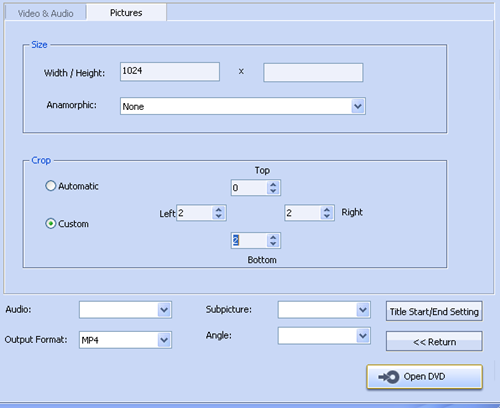 Click "Open DVD" button and the program will automatically analyze DVD structure. 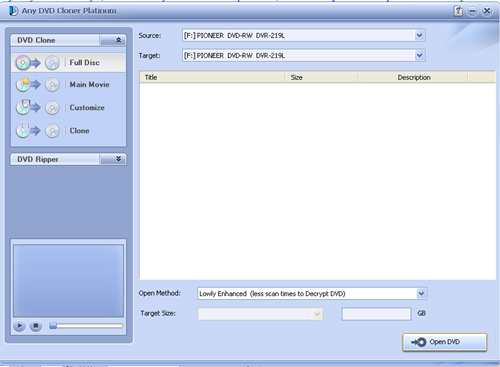 Choose output folder in "Target" , which is used to save the output video file for playback on Motorola Xoom. You can use windows default document folder. Or, select DVD Folder from the drop-down list of the Target option, and browse a folder to save the converted movie. Step 3: Click DVD Ripping mode, and choose classic mode. Keep the default output format MP4, which is supported by Motorola Xoom. Output Format: Keep the default output MP4. Please note you need to select right output format depending on your device. Title Start/End Setting:Click Title Start/End Setting button, you can set chapters you want to convert for a certain title. 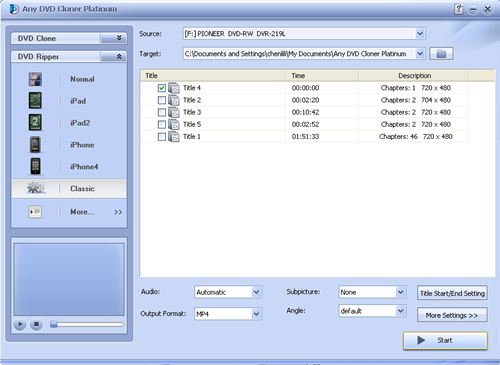 For example, in the following selection, title 2, chapters from 3 to 9 will be converted. "More Settings": Click More Settings button to customize video and audio parameters. Click "More Settings" and two tabs will appear. They are Video&Audio and Pictures. 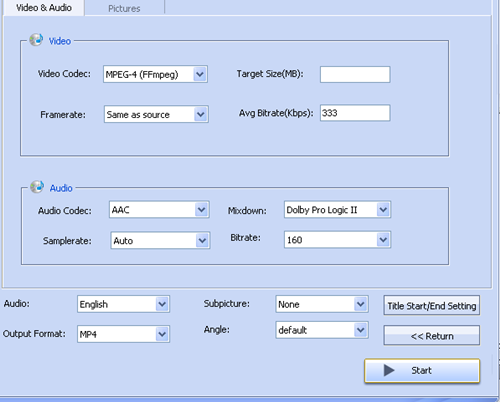 Under the Video & Audio tab, you can set the video and audio parameters. Step 5: Click " Start " button to begin the ripping process. After a while the ripping process will complete, then you can transfer the file to your Motorola Xoom and enjoy the movie!